Fresh off a victory over President Obama and Washington, D.C. bureaucrats in their latest effort to restrict Second Amendment rights, National Rifle Association President David Keene visited Iowa on Thursday. The event at the State Capitol was arranged by the Polk County Republican Party. Around two dozen state legislators were among the crowd of 125 supporters packed into a conference room to greet and listen to Keene. Introduced by state Rep. Clel Baudler (R-Greenfield), Keene spoke at length about the battle with the U.S. Senate and big moneyed liberals like New York Mayor Michael Bloomberg, who spent $12 million in the week prior to the senate vote in an effort to pass gun restrictions. Keene also answered a few questions from the supportive audience. 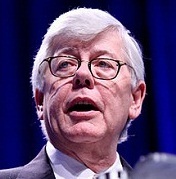 Prior to becoming the NRA’s president in 2011, he served as the chairman of the American Conservative Union from 1984-2011. David Keene has long been considered one of the nation’s most astute political observers. He has played major roles in Republican presidential campaigns and has been lauded for his efforts from both sides of the aisle. Keene granted TheIowaRepublican.com the chance for a one-on-one interview. We discussed the defeat of the gun bill in the U.S. Senate, the truth about what was in the bill, the NRA’s ongoing efforts to protect the Second Amendment and Keene offered his views on Iowa’s 2014 U.S. Senate race.